Today has been the hottest day of the year so far here in North Yorkshire. It is so lovely to see everywhere bathed in bright sunshine and a blue sky is always a welcome sight. I did a lot of gardening yesterday, cutting the grass and digging out a border then planting some plants that my friend Annemarie, a professional gardener, had been growing for me since she first knew I would have a blank canvas here in my new home. Despite it being quite back breaking (and as it happened, literaly both spade-breaking and trowel-breaking), I enjoyed getting my hands dirty and thinking ahead to how it will look in years to come. But it has already made a difference. A touch of colour here and there from delicate young blooms made my al-fresco lunch even more of a treat. I went into town after lunch for the usual array of errands and then on to my friend Sally’s for a quick catch-up. I opted for lightweight cotton floral shorts with a pretty embroidered top. 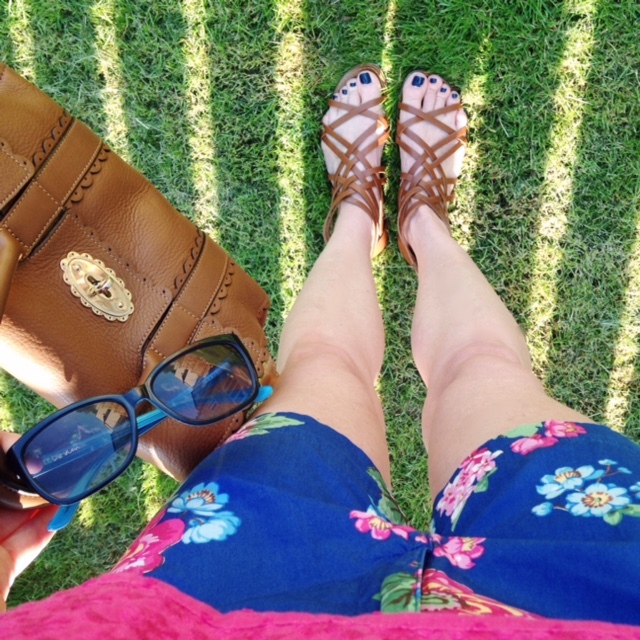 Everything has seen several summers including my tan gladiator sandals and beloved Mulberry Bayswater satchel. I wore these shorts with different accessories for the most beautiful walk along the beach on my summer holiday in Porto Santo last year. Small Bayswater Cookie Cutter Satchel in Oak leather, Mulberry. Previous Post Outfit: Grey Scalloped Top, Denim Shorts and a Statement Necklace.